The success of any planned maintenance program starts with tracking the proper key performance indicators (KPIs). Now, you don’t have to track every little piece of data under the sun, but you need to know the most important indicators to keep you aware of the status of your facility. 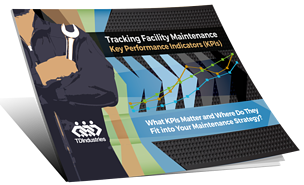 In our e-book Tracking Facility Maintenance Key Performance Indicators, we walk through the KPIs you should always keep top-of-mind. Are you reducing equipment downtime? Are you completing maintenance tasks on schedule? Are the tenants in the facility satisfied with your work? Are you cutting expenses and becoming more efficient? By setting up a method to track these indicators (we even cover recommendations for software to do just that), you will be well on your way toward developing a strong maintenance program. © 2019 TDIndustries. All Rights Reserved. Site designed and developed by Mojo Media Labs.